If you were exempted from taxation, you’d presumably be very happy. After all, even folks on the left do everything they can to minimize their tax payments. Now imagine that you are put in charge of tax policy. Like Elizabeth Warren, you obviously won’t volunteer to start paying tax, but what would you recommend for other people? Would you want them to also enjoy tax-free status, or at least get to experience a smaller tax burden? Or would you take a malicious approach and suggest tax increases, comforted by the fact that you wouldn’t be affected? In this theoretical scenario, I hope most of us would choose the former approach and seek tax cuts. But not everybody feels the same way. The bureaucrats at the International Monetary Fund actually do receive tax-free salaries. Yet instead of seeking to share their good fortune with others, they routinely and reflexively urge higher taxes on the rest of us. Here are some articles, all from the past 12 months, that I’ve written about the IMF’s love affair with punitive taxation. Last June, I wrote about the IMF pushing a theory that higher taxes would improve growth in the developing world. Last July, I wrote about the IMF complaining that tax competition between nations is resulting in lower corporate tax rates. Last October, I wrote about the IMF asserting that lower living standards are desirable if everyone is more equally poor. Last November, I wrote about the IMF publishing a study expanding on its claim that equal poverty is better than unequal prosperity. This February, I wrote about the IMF advocating more double taxation of income that is saved and invested. Needless to say, I especially don’t like it when the IMF urges higher taxes in America. But I think everybody should have more freedom and prosperity, so I also don’t like it when the IMF pushes tax hikes elsewhere. I don’t like it when the tax-free bureaucrats advocate higher taxes on an entire region. I don’t like it when they push a high-tax agenda on big countries. I don’t like it when they urge tax increases on small countries. What upsets me most of all, however, is that the IMF is trying to punish very poor nations is sub-Saharan Africa. This came to my attention when I saw a Bloomberg report about the IMF recommending policy changes in Ivory Coast. At first glance, I thought the IMF was doing something sensible, supporting faster growth and higher income. But I found out that the bureaucrats wanted higher income for the government. Unsurprisingly, local politicians like the idea of getting more loot. The government seeks to gradually increase its tax revenue to 20 percent of gross domestic product from 15.9 percent now, Prime Minister Amadou Gon Coulibaly said in 2017. How sad. Ivory Coast (now usually known as Côte d’Ivoire) is a very poor country, with living standards akin to those of the United States in 1860. 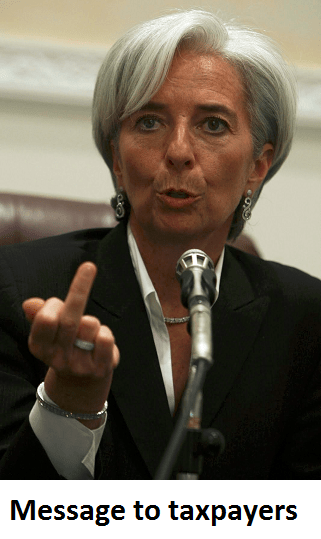 Yet rather than recommend the policies that allowed the United States and other western nations to become rich, such as no income tax and very small government, the IMF wants to fatten the coffers of a corrupt and ineffective public sector. Here’s something else that is sad. This seems to be the advice the IMF gives to all nations in sub-Saharan Africa. Consider this story from Kenya. Kenyans should brace themselves for higher taxes after the Government caved in to the International Monetary Fund’s (IMF) demands. …It made the commitment to the IMF in a letter of intent that spells out a raft of measures that are likely to eat into consumers’ pockets. …The sectors to be hit include agriculture, manufacturing, education, health, tourism, finance, social work, and energy. …The Government hopes to squeeze an extra Sh40 billion in taxes from these sectors. This is likely to have a ripple effect by pushing up the cost of goods and services… The Government intends to increase income tax by over Sh100 billion in the financial year 2018/19. We also have the IMF’s perverse approach to “tax reform” in Nigeria. The International Monetary Fund (IMF) has advised Nigeria to embark on a full Value Added Tax (VAT) reform. …The lender’s Mission Chief for Nigeria, African Department, Mr Amine Mati, …said government must raise taxes… In addition, government should also increase taxes on alcohol and tobacco and broaden VAT. The bureaucrats also want more tax revenue in Tanzania. The International Monetary Fund (IMF) Deputy Managing Director, Tao Zhang has hailed Tanzania for managing to boost tax collection… The visiting IMF leader said it was vital to mobilise more…public resources by strengthening tax collection… “it is crucial to mobilise more…public resources within Tanzania, especially by strengthening tax collection…” he said at a public lecture he gave in Dar es Salaam yesterday. The IMF is even using a $190 million bribe to advocate higher taxes in Ghana. Ghana needs to improve revenue collection…to achieve its fiscal targets, the International Monetary Fund said. …“Fiscal consolidation has to be revenue-based,” Koliadina told reporters in the capital, Accra. …A positive outcome of the fifth and sixth reviews of the program will lead to the IMF disbursing $190 million to Ghana, Koliadina said. Last but not least, let’s look at the IMF’s misguided advice for Botswana. The Government of Botswana should seek to strengthen its revenue base…, the International Monetary Fund has said. …”The authorities agreed that there is a significant potential to boost domestic revenues through tax administration and tax policy reforms that could…provide additional funding for future fiscal expenditures,” the report stated. Higher taxes to finance bigger government? Wow, talk about economic malpractice. Since Botswana has been one of the few bright spots in Africa, I hope lawmakers tell the IMF to get lost. But I worry that politicians will be happy to take the IMF’s bad advice. These are the only nations I investigated, so I guess it’s possible that there’s a sub-Saharan nation where the IMF hasn’t recommended higher taxes. Heck, it’s even theoretically possible that the bureaucrats may have suggested lower taxes somewhere on the continent (though that’s about as likely me playing pro football next season). I’ll simply note that the IMF openly admits that it wants higher taxes all across the region. Tax revenues play a critical role for countries to create room in their budgets to increase spending on social services…raising tax revenues is the most growth-friendly way to stabilize debt. More broadly, building a country’s tax capacity is at the center of any viable development strategy …we see potential in many countries of sub-Saharan Africa to raise tax revenues by about one percent of GDP per year over the next five or so years. …Since building the capacity to collect more from personal income taxes takes time, in the next few years VAT and excise taxes likely offer the biggest potential for additional revenue. For example, recent studies by the IMF indicate a revenue potential of about 3 percent of GDP from VAT in Cape Verde, Senegal, and Uganda, and ½ percent of GDP from excises for all countries in sub-Saharan Africa. …It is also important to consider newer sources of revenue, such as property taxes. …Raising revenues is often a politically difficult task. But the current economic junction in sub-Saharan Africa together with sustained development needs creates an imperative for action now. I’m almost at a loss for words. It’s mind-boggling that anybody could look at policy in sub-Saharan Africa and conclude that the recipe for growth is giving more money to politicians. And I’m equally flabbergasted that the IMF openly claims that bigger government is good for growth. Unsurprisingly, the bureaucrats never try to justify that bizarre and anti-empirical assertion. For those who are interested in genuinely sensible information on how poor nations can become rich nations, I strongly recommend this video from the Center for Freedom and Prosperity. P.P.S. In other words, this cartoon is very accurate.